You can feel the tenacity firmly. Powerful all-round model. Because it is 4U even balance, there is no feature in handling and swinging. Because the shaft is soft and the face is also large, it is easy to skip even those with slow swing speed. I think whether it is particularly easy to receive. 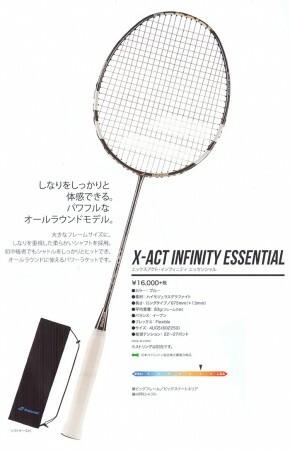 I think that it is not suitable for extreme hard hitters, but I think that it is a racket recommended for a wide range of people who like soft hit feeling and beginners who do not fly clear. I used to own it. The price range was also affordable and easy to use. It's a really standard one in 4U even these days. Handling will be so-called "normal". It is neither heavy nor special. Shakenuki is also common. The feeling of hitting is "soft", but there is no feeling of henna hena. Control is not bad either. Because it is a basic soft shaft, there is no difficult point, and this is the best for beginners and beginners. It is recommended that women feel that the shuttle will extend if it is slightly loosened and lightly shaken. A racket will help you. Therefore, it is unsuitable for the high-speed type of swing speed. Especially smash does not sink. For the first one, I think that if you get this and get well, you should choose various rackets. If it is a men with a slower swing speed defensive player or control player, and a female player, regardless of play style, it may be possible to use it for as long as medium level. Because grip is 5 G, it is quite generally easy to handle, so it quickly became familiar with the hand. I bought it slightly as soon as I bought it, but I can rest assured that the frame etc could be used without distorting at all. The size of the frame was also quite large, so it was easy to hit the sweet spot and it was easy to use. ankle	（Experience：２〜３ years）	Recommended for one replacement. Because I got tired of the racket I bought first, I bought this one which was recommended for a racket for intermediate level. There is an impression that the frame size is big compared with other rackets, and it is quite fun to put it in the sweet spot. Compared to other rackets, it is attractive that the sweet area is large because the frame size is large. With a solid hit feeling, I can easily feel the power-up, so it's a lot of fun. It is a very recommended racket for intermediate people. Sincerity	（Experience：２〜３ years）	It is a racket that supports step-up of an intermediate person. It is characterized that the sweet area is wide because the frame size is made slightly larger than the others. Therefore, it is characterized by hit a solid hit, I think that it is the best racket for intermediate users to step up further. Koi Trek	（Experience：６〜１０ years）	It is easy to use. This racquet features a large sweet area because the frame size is large. It's easy to use because it's easy to hit. Since the frame is also light, I think that it is also a good point to grasp and be less tired. It is not very major, but it is a racket that you can recommend.